Neem Liquid Extract, Organic Neem (Azadirachta indica) Dried Leaf Tincture Features and description: NON GMO! Gluten Free! Highest Strength Neem liquid extract! Neem liquid extract contains ONLY natural ingredients! High Quality Neem liqui..
Night Blooming Cereus (Cereus Grandifloras) Dried Inflorescence Liquid Extract, Bang Wa Hua, Herbal Supplement Features and description: NON GMO! Gluten Free! We produced this extract using a cold maceration method of extraction to ensure that the..
Ningpo Figwort (Scrophularia Ningpoensis) Tincture, Dried Roots Liquid Extract, Xuan Shen, Herbal Supplement Features and description: NON GMO! Gluten Free! We produced this extract using a cold maceration method of extraction to ensure that the b..
Niu Bang Zi Liquid Extract, Niu Bang Zi, 牛蒡子, Burdock (Arctium Lappa) Seed Tincture Features and description: NON GMO! Gluten Free! 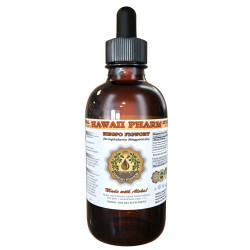 Highest Strength Niu Bang Zi liquid extract! Niu Bang Zi liquid extract contains ONLY natural ingredients! High Qua..
Niu Da Li Teng (Millettia Speciosa Champ.) Tincture, Dried Stems Liquid Extract, Callerya speciose Champ., Herbal Supplement Features and description: NON GMO! Gluten Free! We produced this extract using a cold maceration method of extraction to e..
Niu Xi (Huai) Liquid Extract, Niu Xi (Huai), 怀牛膝, Achyranthes (Achyranthes Bidentata) Root Tincture Features and description: NON GMO! Gluten Free! Highest Strength Niu Xi (Huai) liquid extract! Niu Xi (Huai) liquid extract contains ONLY natural i..
Noni Liquid Extract, Organic Noni (Morinda citrifolia) Dried Fruits Tincture Features and description: NON GMO! Gluten Free! Highest Strength Noni liquid extract! Noni liquid extract contains ONLY natural ingredients! High Quality Noni liquid extr..
Nopal Cactus Liquid Extract, Nopal Cactus (Optunia Streptacantha) Whole Cactus Dried Tincture Features and description: NON GMO! Gluten Free! Highest Strength Nopal Cactus liquid extract! Nopal Cactus liquid extract contains ONLY natural ingredien..
Nu Zhen Zi Liquid Extract, Dried fruit (Ligustrum Lucidum) Tincture Features and description: NON GMO! Gluten Free! We produced this extract using a cold maceration method of extraction to ensure that the broad spectrum of therapeutic plant compou..
Nut Grass Liquid Extract, Dried rhizome (Cyperus Rotundus) Tincture Features and description: NON GMO! Gluten Free! We produced this extract using a cold maceration method of extraction to ensure that the broad spectrum of therapeutic plant compou..
Nutmeg Liquid Extract, Organic Nutmeg (Myristica Fragrans) Dried Nut Tincture Features and description: NON GMO! Gluten Free! Highest Strength Nutmeg liquid extract! Nutmeg liquid extract contains ONLY natural ingredients! High Quality Nutmeg liqu..